CEO Sergio Marchionn is expected to respond to multiple offers for the business being sent to FCA, sources told Reuters. LONDON/MILAN (Reuters) -- Fiat Chrysler Automobiles is considering whether to sell its auto parts maker Magneti Marelli after receiving interest from potential buyers, sources familiar with the matter told Reuters. At least two U.S. private equity funds are looking to team up with industry players and submit joint bids for Magneti Marelli, which supplies all major carmakers in Europe, the Americas and Asia, three sources told Reuters. Gualberto Ranieri, a U.S.-based spokesman for FCA, said Magneti Marelli is not for sale. Debt-laden FCA could sell the unit either in parts or in entirety, the sources said, adding that no final decision on a disposal had been taken. Magneti Marelli has often been touted as a takeover target. While FCA has always denied any interest in selling, the sources said the Italian-American carmaker had recently told interested parties it may reconsider its plans. The world's seventh-largest carmaker currently has its hands full with a planned flotation of sports car maker Ferrari, slated for after mid-October, and any decision on Magneti Marelli would be taken after that, the sources said. Yet U.S. buyout funds have been working on the dossier for months, the sources said. "Letters are piling up on Fiat's table," one of the sources said. "We expect Chief Executive (Sergio) Marchionne to react to these approaches sooner rather than later." A sale of the unit, which employs more than 38,000 people and is present in 19 countries, could help FCA pay off some debt and fund a 48 billion euro investment plan. 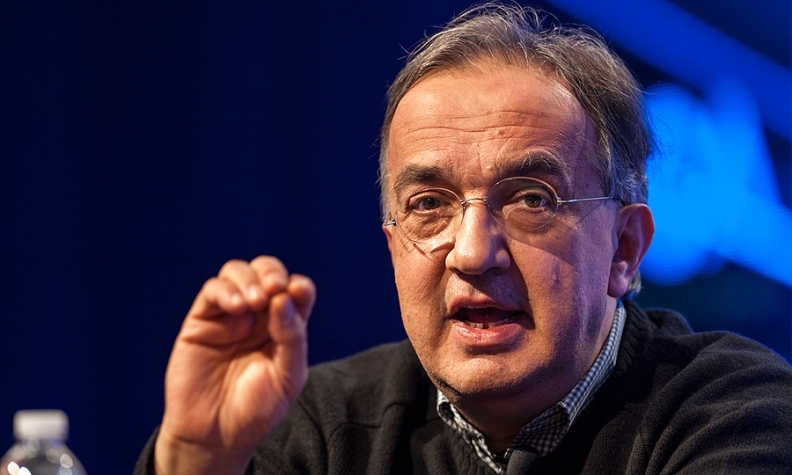 The plan could gain traction as Marchionne's plea to merge with rival carmaker General Motors has fallen on deaf ears. Magneti Marelli ranks No. 30 on the Automotive News list of the 100 largest suppliers with worldwide direct sales to automakers of $8 billion in 2014. Two-thirds of its business is generated in Europe, the list shows. The company posted an operating profit, including unusual items, of 204 million euros ($221 million) last year. It makes components for lighting, engines, electronics, suspension and exhausts, among other items. The bidders would aim to gain full control of Magneti Marelli and later split it up based on their own expertise, the sources said. "Everyone will take a fair share of it," said one source. A number of large buyout funds, mainly U.S.-based, are particularly interested in Magneti Marelli's lighting unit, which could be carved out and turned into a standalone firm, the source said. This unit is worth around 2 billion euros and could appeal to global players such as Valeo, Hella, Koido and Stanley, a sector banker said. Asian players could also make a move, another source said, pointing to China's Wanxiang Group as a possible bidder. Auto parts makers have shown growing appetite for acquisitions as they look to boost their global presence. Earlier this year Germany's ZF Friedrichshafen completed the $13.5 billion acquisition of U.S. rival TRW Automotive Holdings. Magna International Inc. on Thursday announced a $1.9 billion agreement to acquire German transmission giant Getrag. And automotive safety products supplier Autoliv late Thursday said it would acquire M/A COM's automotive technology unit near Boston for at least $100 million. Marchionne is in no rush to sell Magneti Marelli and will be picky when choosing a buyer to ensure a stable future supply of components to FCA plants, which churn out anything from Fiat 500s to luxury Maseratis. Another source said FCA may also review strategic options for two smaller auto components units, Comau and Teksid, with revenues of 1.55 billion euros and 639 million respectively. In 2012 Marchionne said Fiat could put Magneti Marelli on the block as an option to raise cash to lift its stake in Chrysler. Fiat completed its buyout of the U.S. unit last year.